Over the weekend, I got a message from Mark that he had been contacted by an Australian TV show called The Living Room that was here in L.A. doing some segments about various things here. And they wanted to do a piece about competitive stair climbing. 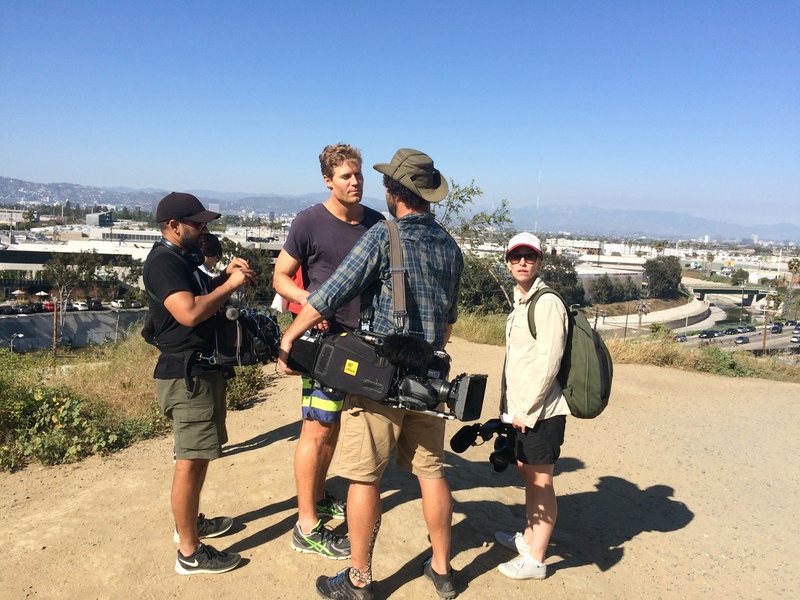 So we agreed to meet with them at the Culver City stairs. I thought this might be amusing, although I’d never actually climbed those stairs before. I rode Metro Rail out there, which was really easy, although it feels a bit subversive to be riding the train around Los Angeles. But I brought my bike, and the park with the stairs was only about a mile from the Metro station. So it was only a matter of five minutes or so to ride there. Once we were all there, we met up with the TV crew. 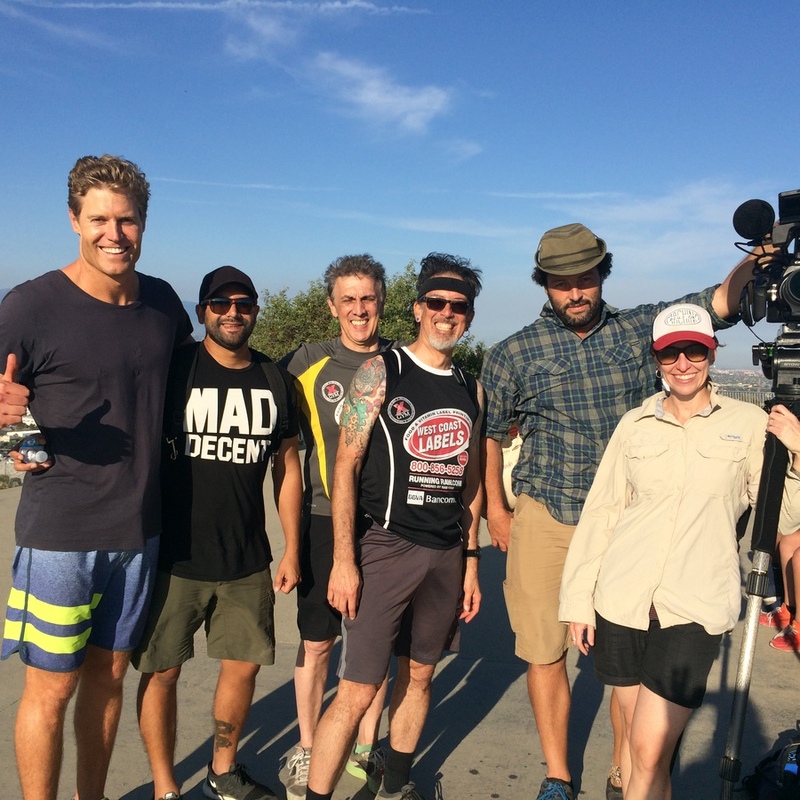 They had their correspondent, Chris, the producer, Leisa, and a camera guy and sound guy, along with a producer’s assistant and a person from the L.A. tourism office. They put microphones on us to record everything we said, I suppose just in case we said anything amusing. 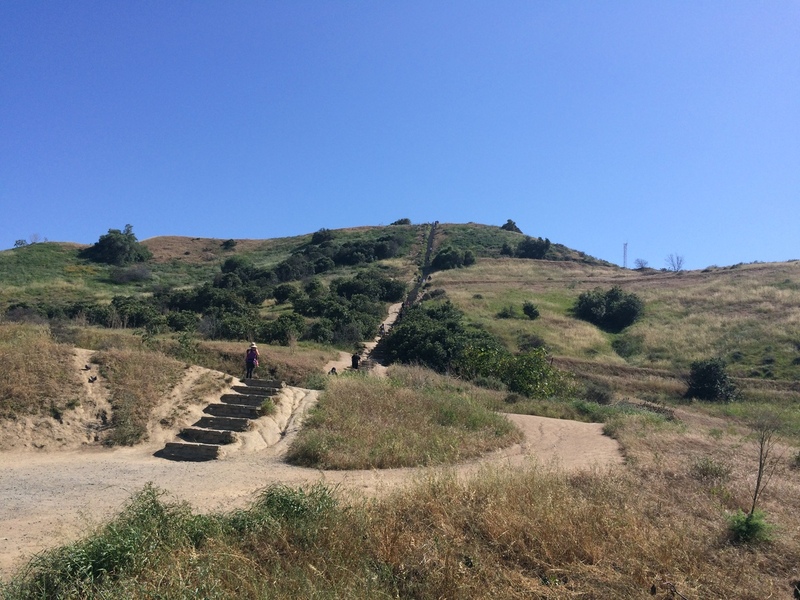 Offhand, I’d hope they can find some way to use when I was saying, “you know you’ve paced yourself right in a stair climb when you get to the top and have no memory of the last ten floors.” We ran up the stairs, one segment at a time. We’d do one short segment, and then the camera and sound guys would walk ahead of us to set up before we ran up the stairs to where they were. And at the top, we set it up where Mark was telling Chris that we had to run the last bit, and then Veronica came up behind us and passed all of us to beat us to the top. At the top, Mark gave Chris a West Coast Labels team shirt, and we all posed for pictures and a final shot for the segment. The word is that it will be ready and air in July, so we’ll be looking forward to that. All in all, it was a fun afternoon. But you didn’t say what you thought of the stairs, what with all the weird heights. What was it like for you? It was hard. I tripped once on one of the taller steps, and yes, the overall un-even-ness of them made them very hard. But Mark warned me about that. He tripped a couple times, too.